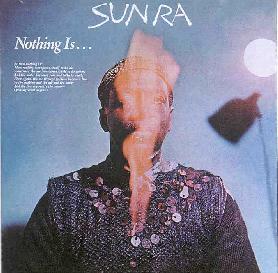 Sun Ra - "Nothing Is..."
I don't remember what prompted me some years ago to check out Sun Ra. I'm sure it was the space mystique he built around himself. In any event, his music was, and still is, readily available in most commercial music stores, particularly the Evidence series of reissues. The first one I bought was the Evidence reissue of Angels And Demons At Play/The Nubians Of Plutonia. I'd long been a fan of jazz and avant progressive rock and there was something about much of Ra's music that, while rooted in jazz, seemed to reach out into various forms of avant garde and ethnic musics to create something truly exciting and unique. And I've been hooked ever since. Nothing Is... was one of a handful of Sun Ra releases on the ESP label, his Concert For Comet Kahoutek being one of the wildest and most experimental jazz recordings I've ever heard. Electronic musicians would do well to check it out as Ra was a pioneer in his use of synthesizers. Thankfully, the Calibre label, based in The Netherlands, is now reissuing all the old ESP recordings complete with detailed original liner notes. Quite a nice package. Nothing Is... is a classic Sun Ra free-jazz exploration. On "Dancing Shadows", a huge horn section combines with Ra's piano, and Clifford Jarvis keeps the rhythm in check on drums. Arkestra mainstays John Gilmore, Marhsall Allen, and Pat Patrick are a dominating trio kicking out passionate and often fiery licks on their horns. I've frequently said that as a lead instrument, the saxophone is just as potent a force in jazz as the electric guitar is in rock music, and those who need convincing can step right this way. (Coltrane's "Ascension" was what first turned me on to the magic and power of the sax.) It's either oboe or clarinet heard on "Exotic Forest", but this tune is led by a seductive snake charming melody that seems to be surrounded by a circle of African styled percussion. The combination of African and Egyptian influences produces a haunting effect, with the deep sound of the standup bass playing a simple, repetitive, but effective line that serves as the ensemble's backbone. And speaking of bass, check out Ronnie Boykins' killer solo on "Shadow World". Vocals are present at times too, usually to place the proceedings firmly in the cosmos. The musicians chant, "the second stop is Jupiter, the second stop is Jupiter", as the horns wail in frenzied unity. And there's Ra playing a beautiful piano melody as we hear the group chant, "Sun Ra, and his band, from outerspace, will entertain you now". Ra's playing quickly becomes dark and intense, and the horns go ballistic. Just beautiful. The free-jazz version of acid rock. Aural Innovations readers who are into jazz surely know Sun Ra's music by now. And the jazz curious among you who have yet to take the plunge could do no better than to step through the Sun Ra portal as the beginning of your journey. The music on Nothing Is.. features big band Arkestra at its very best. Though more cautious space fan might do well to start with such Evidence reissues as Angels And Demons At Play/Nubians Of Plutonia, Sun Ra Visits Planet Earth/Interstellar Low Ways, Atlantis... there's loads of great starting points. Feel free to drop me an email if you have questions. For more information you can email Calibre at: bgi@byton.nl. Note that this and the other ESP reissues should be available in record stores like Tower and other chains in the USA.